Now that Donald Trump is the official republican nominee, it's time that feminists start to emotionally prepare for him becoming the next President of the United States. If you don't mind excusing me for one moment, I just dry heaved to the point of vomiting blood. But thank god it's coming out of my mouth, because I don't want Trump to think I'm like Megyn Kelly! Trump's rise to power has been accredited to the disenfranchised right wing finding his rhetoric "refreshing." It's their belief that with Trump's leadership, they will "Take back America!" But guess what? Feminists have also been looked over by the current political status quo. Rather than cat fighting with our Trumpette sisters, WE SHOULD JOIN THEM! (Okay now the blood is pouring from both orifices - I think my uterus just killed herself). You might be asking yourself, "why would a woman ever vote against her own interests," but that's assuming I understand complicated words like "her," and "own." 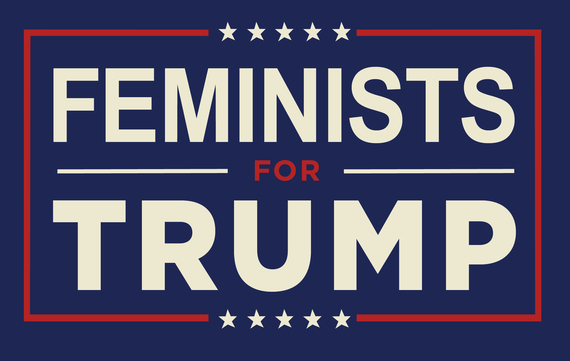 There are plenty of reasons feminists should vote for Donald Trump. Mainly because as a woman, I don't have to be rational! Here are 5 reasons why feminists should vote for Trump!